If it’s August, then it’s market time! 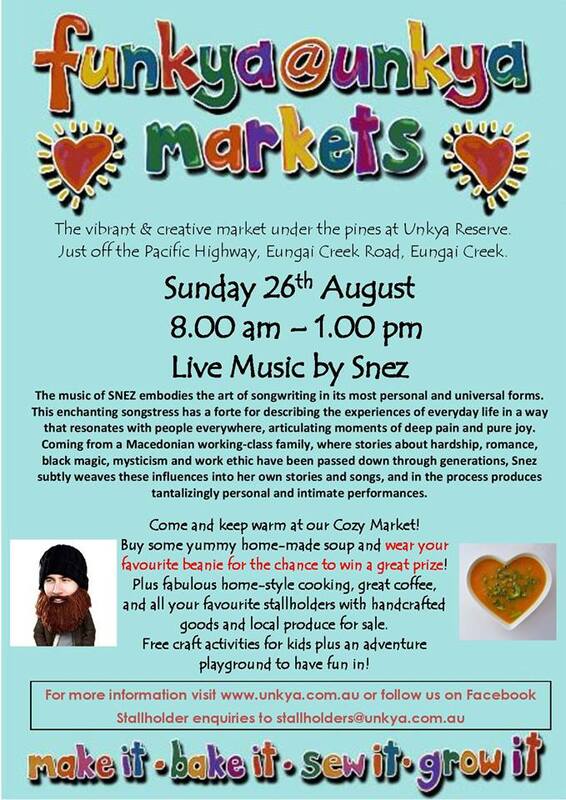 Come to the Funkya@Unkya Cozy Market on Sunday 26 August from 8am to 1pm – wear your favourite beanie and you might win a prize!! Grab some yummy homemade soup, damn fine coffee and great homebaked cakes and check out the Make It, Bake It, Sew It, Grow It, Recycle wares from our amazing stallholders. Listen to the soulful sounds of Snez, who combines hardship, romance, black magic and mysticism in her tantalizingly beautiful songs. Plus free craft activities for the kids and our adventure playground! See you at Unkya Reserve, Eungai Creek Road, Eungai Creek. If you want to book a stall, don’t leave a message here – email stallholders@unkya.com.au.